Nissan and Italdesign have developed a new vehicle in their first-ever collaboration - the Nissan GT-R50 by Italdesign - with a plan in place to produce an exclusive run of just 50 examples. Based on a production GT-R NISMO model, the car commemorates the 50th anniversaries of both the GT-R and Italdesign and is set to make its debut at the Goodwood Festival of Speed. Italdesign developed, engineered and built the car while the exterior and interior designs were created by the teams at Nissan Design Europe in London and Nissan Design America. Up front, a distinct golden inner element stretches across almost the full width of the vehicle. The bonnet has a more pronounced power bulge, and the thin LED headlights stretch from the wheel arch to the lip above the outer cooling intakes. Riding on 21-inch wheels, the side profile is characterised by a lower (by 54mm) roofline which features a lower centre section with slightly raised outer portions for a more muscular look while the tradwemark GT-R “samurai blade” cooling outlets behind the front wheels are more prominent with a gold inlay extending from the bottom of the doors to the shoulder line. 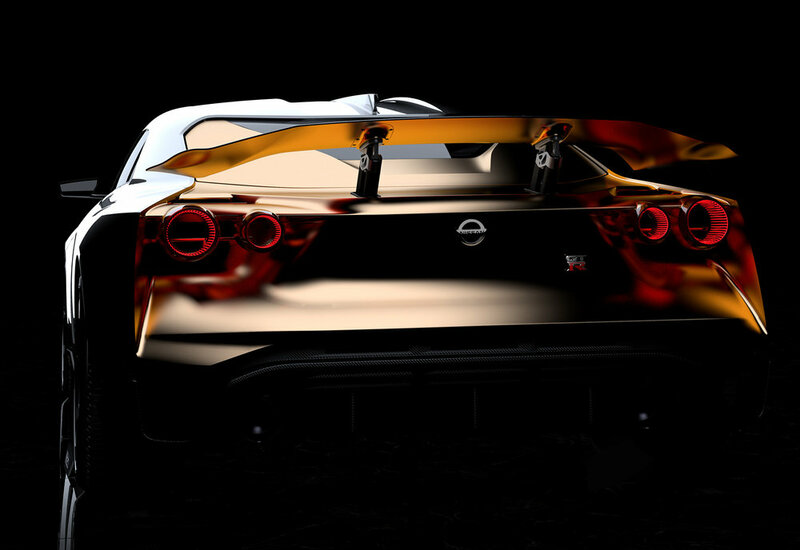 The GT-R’s twin round taillights have been reworked as a separate “floating” feature with thin light rings and hollow centres while a large, adjustable rear wing, mounted with two uprights, completes the overall look of the prototype which is finished in a Liquid Kinetic Grey paint with gold anniversary accents. Inside, two different carbon fibre finishes are used across the centre console, instrument panel and door linings, along with black Alcantara and fine black Italian leather on the seats. Gold accents echo the exterior treatment across the instrument panel, doors and the futuristic race car-inspired switchgear. The bespoke steering wheel’s central hub and spokes are made of carbon fibre, while the rim features a flat bottom and matching Alcantara trim. Underneath the new shape, the GT-R50 by Italdesign means business. Drawing on Nissan’s GT3 racing experience, the NISMO organisation enhanced the hand-built 3.8-litre V6 VR38DETT engine to produce an estimated 720ps and 780 Nm of torque. Revised suspension has been developed, featuring the BILSTEIN DampTronic® I continuously adjustable damping system. For braking, the Brembo six-piston front and four-piston rear brakes feature bright red calipers, while Michelin Pilot Super Sport tyres, 255/35 R21 at the front and 285/30 R21 at the rear, ensure a level of grip to match the vehicle's supercar levels of performance. “Although this is not the next-generation GT-R, it is an exciting celebration of two anniversaries in a provocative and creative way – wrapping one of Nissan’s best engineering platforms and Japanese design with Italian coachbuilding,” said Alfonso Albaisa, Nissan’s senior vice president for global design. Pending the GT-R50 by Italdesign's reception at Goodwood and other global appearances in the coming months, a customer version inspired by the prototype may be created. No more than 50 units would be produced by Italdesign – with each car tailored for each customer – with a price estimated to start at about €900,000.